Самолет DH.84 Dragon разработали в ответ на запрос Эдварда Хиллмана, главы компании "Hillmans Airways Ltd", на двухмоторный самолет для предполагавшейся авиалинии между Парижем и Лондоном. Для нового самолета спроектировали фанерный фюзеляж с плоскими бортами, ДальшеMore>>> аналогичный фюзеляжу Fox Moth. Двухстоечная бипланная коробка состояла из двух центропланов, к нижнему из которых крепились два мотора Gipsy Major в обтекаемых гондолах, и консолей, которые могли складываться поворотом назад. Пилот сидел в отдельной закрытой кабине в носовой части. Пассажирский салон вмещал шесть человек. Прототип впервые взлетел 12 ноября 1932 года. Позднее его поставили компании "Hillmans Airways" в Мэйлендсе, графство Эссекс, вместе с тремя серийными машинами Dragon Mk 1. Авиалиния до Парижа была открыта в апреле 1933 года. В Британии собрали 115 серийных самолетов - сначала в Стэг-Лэйне, а с 1934 года на новом заводе фирмы "de Havilland" в Хэтфилде. Еще 87 машин собрали в Австралии во время Второй мировой войны на заводе фирмы "de Havilland Australian" в Бэнкстауне, Сидней, для обучения радистов и штурманов. Первый из этих австралийских самолетов взлетел 29 сентября 1942 года. DH.84M Dragon: военная версия с форкилем. Вооружение состояло из двух пулеметов (один в носовой части, другой на надфюзеляжной кольцевой турели) и 16 бомб калибра 9,1-кг. Машины этого типа поставлялись в Данию (две), Ирак (восемь) и Португалию (три). SUPERFICIALLY there is little to tell one that the new de Havilland D.H.84, or "Dragon" as the class has been named, is a very remarkable aircraft. In external appearance it is just a plain, well-proportioned twin-engined aeroplane with wings of unusually high aspect ratio (if one may still employ this old-fashioned term) and a simple well streamlined undercarriage. For several years it has been our custom to use two ' figures of merit'' in describing aircraft: The ratio of gross weight to tare weight, and the Everling "Highspeed Figure'' n/2Kp, which is the minimum drag coefficient divided into the propeller efficiency. The reason for using 2Kp instead of Kp is that the value thus obtained is then directly comparable with that of machines the characteristics of which are expressed in metric units. The ratio of gross weight to tare weight is an index of the structural efficiency of the aircraft, and the Everling "Highspeed Figure" is a measure of the aerodynamic efficiency in that for the same propeller efficiencies machines with the same "High-speed Figure" will have the same minimum drag coefficients. In the case of the de Havilland "Dragon," both these "figures of merit" have an unusually high value. For example, the tare weight of the machine, equipped to carry six passengers, is 2,300 lb. (1 045 kg.) and the permissible gross weight is 4,200 lb. (1 910 kg. ), so that the ratio of gross to tare weight is no less than 1.825. The machine, in other words, carries as normal disposable load and not as in any way an overload, 82.5 per cent, of its own weight! This is a quite remarkable achievement, and has only been equalled, to the best of our knowledge, by the de Havilland "Fox Moth," in which the value exceeds 90 per cent. The structural efficiency should, to be really convincing, be related to the speed of the aircraft since a very slow machine can more easily be given a large ratio of gross to tare weight than a fast machine. This is where, to some extent, the "High-speed Figure” comes in useful, in that its calculation is based upon maximum speed. The top speed of the de Havilland “Dragon" is about 130 m.p.h. (official figures are not available, but flying the "Dragon" against a "Puss Moth," the former was the faster), and the "High-speed Figure" works out at 21.6, which must be regarded as very good for a twin-engined machine, and points to a low minimum drag coefficient. At 85 per cent, of top speed the cruising speed is 111 m.p.h., so that the machine is not by any means a, slow one. Thus both in structural and in aerodynamic efficiency the "Dragon" can be said to be well above the average. These two "figures of merit" are chiefly of interest to the technician, and may not convey very much to the potential operator, although the fact that the machine carries as disposable load such a large percentage of its own tare weight does tell him that his pay load is likely to be a very useful one. What the operator really wants to know is how much the machine will cost him, either per passenger seat or per lb. of pay load, and what the running and operating costs are likely to be. These figures are not quite as readily assessed as are the two technical "figures of merit" referred to above. But a very fair idea can be formed without going into a lot of perplexing figures. 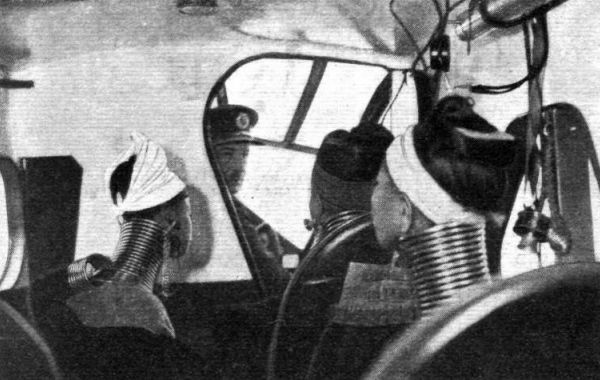 Some, years ago, at the lecture by Herr Martin Wronsky to the Royal Aeronautical Society, we believe, Mr. C. C. Walker, chief engineer of the de Havilland Aircraft Company, expressed the view that a transport aeroplane may be considered efficient if its first cost is less than ?500 per passenger seat installed, and if, also, it carries a passenger 100 miles in one hour at the expenditure of about 2 gallons of petrol. Let us see how the new de Havilland "Dragon" fares when measured with Mr. Walker's yard stick. Normally the "Dragon" will have seating accommodation for six passengers. This number can be increased if a shorter range is sufficient. With six passengers (each assumed at 160 lb. weight, and allowing 45 lb. of luggage for each passenger), the cruising range is in the neighbourhood of 460 miles. The "Dragon" will be marketed at ?2,795, so that the first cost per passenger seat amounts, on this basis, to ?465.8. So far the machine is well below that laid down by Mr. Walker some years ago. When the machine is used on short routes, so that the number of passenger seats can be increased to eight, the cost per seat reduces to ?349.4, an even more economical figure. Another way of looking a t it is to examine the first cost per lb. of pay load. This, obviously, must be related to the range, and it is only possible to compare machines having the same range. When the "Dragon" carries 60 gall, of petrol, sufficient for approximately 460 miles, the pay load is 1,240 lb., so that first cost per available pound of pay load is ?2.25 for that range. If the range is reduced, the pay load is, of course, correspondingly decreased. It is estimated that the fuel consumption of the two "Gipsy Major" engines will be approximately 13 gall, (or about 100 lb.) per hour. From this it is easy to work out the variation of pay load with range, or rather with duration. For example, if a duration of two hours is sufficient, the pay load will be increased by 260 lb. to 1.500 lb., and in that case the first cost per lb. of pay load is reduced to ?1.86. Now for Mr. Walker's other criterion of efficiency. That an aeroplane, to be regarded as economical, must carry each passenger 100 miles in one hour for the expenditure of about 2 gall, of petrol. The "Dragon" cruises at 111 m.p.h. approximately. Its two engines consume about 13 gall, of petrol in an hour. This consumption corresponds to very slightly more than the 2 gall, per passenger per hour, but, on the other hand, the passenger is carried 111 instead of 100 miles for the quantity of fuel. It may be argued that petrol is only a small percentage of the operating cost. That is, of course, perfectly true, but at the same time the power expenditure per passenger, or in other words the amount of fuel consumed in transporting a passenger a given distance, is a very useful index to what the Germans call "Rentabilitat." Within reason, maintenance, running costs (fuel and oil), etc., are proportional to engine power, and this, therefore, forms a fairly good guide to the economy of an aeroplane. The "Dragon" has a total of 260 b.h.p., so that, with 460 miles' range, six passengers and plenty of luggage, the power expenditure is 43.3 h.p. per paying passenger. This is in itself a very economical figure, and if a shorter range is sufficient and eight passengers are carried, the figure becomes 32.5 h.p. per paying passenger. Few would deny that this represents economical flying. Still adhering to the original range of 460 miles, the useful load of the machine can be expressed as a pay load of 4.77 lb. per h.p., or, at the cruising consumption at 111 m.p.h. of 13 gall, per hour, as 4.73 ton-miles per gallon. This relates to the machine as equipped to carry six passengers with their luggage. If the cabin furnishings were removed and the machine used as a freighter, the figure would become somewhat better, while any decrease in the range would, of course, still further improve the ton-mileage per gallon by giving an increase in pay load. 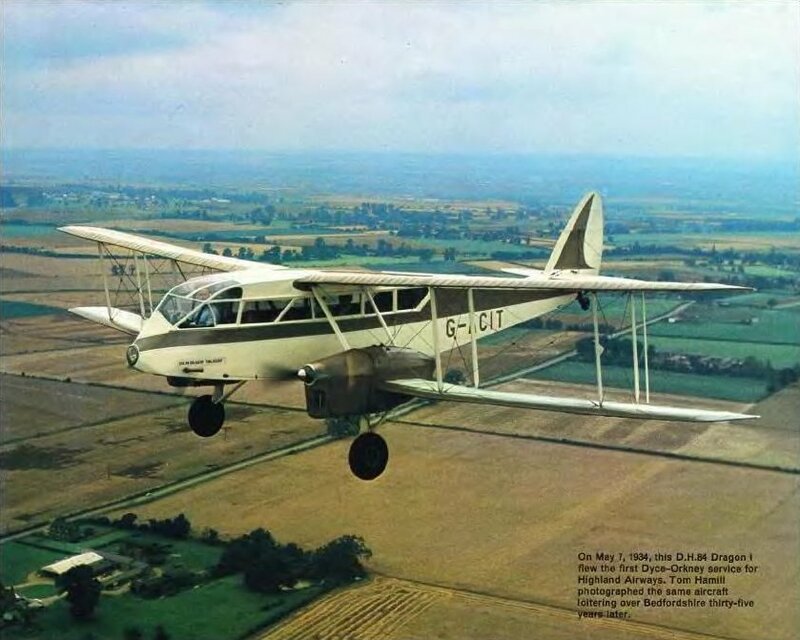 We have gone into these figures for the de Havilland "Dragon" fairly fully, because the machine appears to be the nearest approach to an aircraft capable of remunerative operation which has ever come to our notice. In fact, we would be inclined to go further than that and definitely to express the view that the machine does make unsubsidised flying commercially possible. In its general design the D.H. "Dragon" is not, as already pointed out, in the least unorthodox. It is a twin-engined biplane characterised by wings of somewhat larger span than one is accustomed to, but of narrow chord. The machine went through the design stage very quickly indeed, and the construction of the first machine (shown in our photographs) was also pressed on rapidly, so that although the design was only started in September last, the first test flight was made on November 24 by Capt. H. Broad. Structurally the "Dragon" is a typical de Havilland machine, if by that one means the type of construction used by that company almost entirely some few years ago, before the metal "fashion" had got as many adherents as it has nowadays. To those who believe that all aircraft should be built of metal, whatever their size and type, the "Dragon" will seem a retrograde step. It is, however, a step which has made the "Dragon" possible. Had it been built in metal it would certainly have been a good deal heavier, and very much more expensive. That the need for all-metal construction of civil types is as real as in military aircraft has not been proved. The de Havilland Company has had wooden "Gipsy Moths" flying in almost every corner of the world, and such troubles as have been encountered have been relatively small. Shrinkage of wood, absorption of moisture, warping, and so forth, have been far less than many would suppose, and recent work on the subject has indicated that these minor troubles may be overcome. The use of dished washers for maintaining friction or "grip" when wood shrinks, the protection of corners where moisture may accumulate with doped fabric or bitumastic paint, and so forth, have been found effective antidotes. And apart from the lightness and cheapness of wooden construction, there are many advantages, such as greater ease of repair in out-of-the-way places. The "Dragon," then, is a very ordinary aircraft structure, with a fuselage covered with three-ply wood, and wings having spindled I-section spars and wooden ribs. The only metal in the structure, a few fittings apart, is the steel tubing of the engine supports in the wings. The petrol tanks are carried in the fairings behind the engines, and supply to the carburettors is by pump, the head available being barely sufficient to ensure gravity feed under all conditions. Our sketches show these steel structures in the wings, but it should be pointed out that the engine bearers themselves are not shown. They pick up on the foremost points of the structure shown, a bulkhead being interposed. The cabin is of fairly large dimensions, 9.75 ft. X 4.5 ft. x 4 ft. The six seats are placed along the sides, and are very comfortable. If no lavatory is fitted there is a luggage compartment of 50 cu. ft. capacity, but a lavatory reduces this to 20 cu. ft.
A slightly unusual scheme has been followed in the design of the undercarriage. This is of the "split" type, and the wheel-carrying strut is telescopic, each tripod being a rigid structure, with the strut telescoping into the fixed strut, and carrying the wheel cantilever fashion. The chassis struts go to the engine-carrying steel tube frame in the wing, and the landing load is taken by a diagonal strut to the top corners of the fuselage. 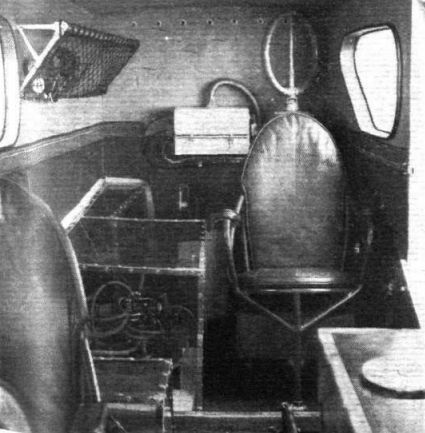 The pilot's cockpit in the nose of the fuselage is cut off from the cabin by a partition. The view obtained is very good, and the pilot can see both his engines. Final official performance figures are not yet available, but during the take-off tests a height of 145 ft. was reached in a distance of 456 yards, instead of the 66 ft. stipulated in the regulations. A height of 3,240 ft. was reached in 5 min., so that there is nothing to complain about in the take-off of the machine. 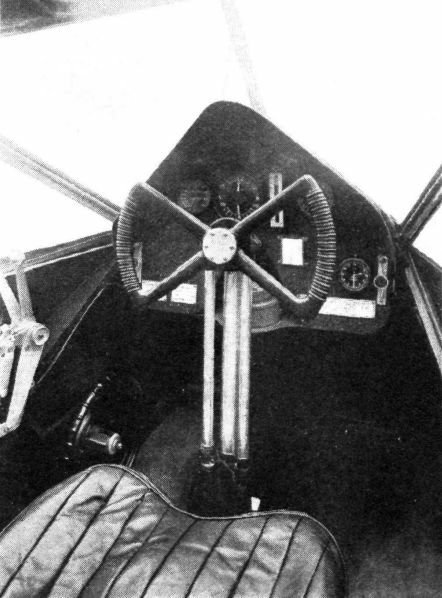 The pilot's cockpit, comfortable roomy and with a perfect view in all directions. 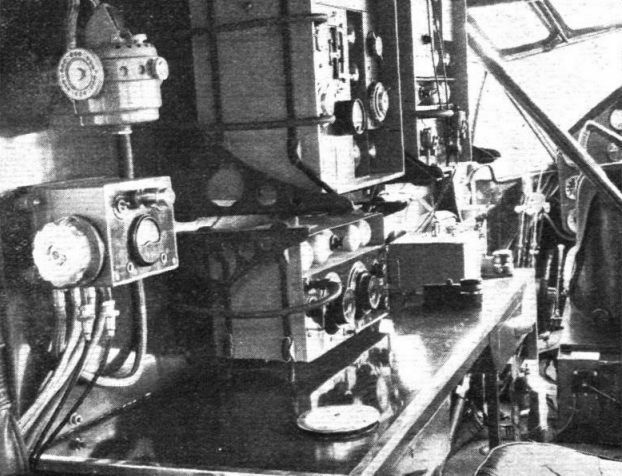 The ATR 4, a medium wavelength transmitter and receiver for Civil and Military aircraft installed in De Havilland Dragon Moth. 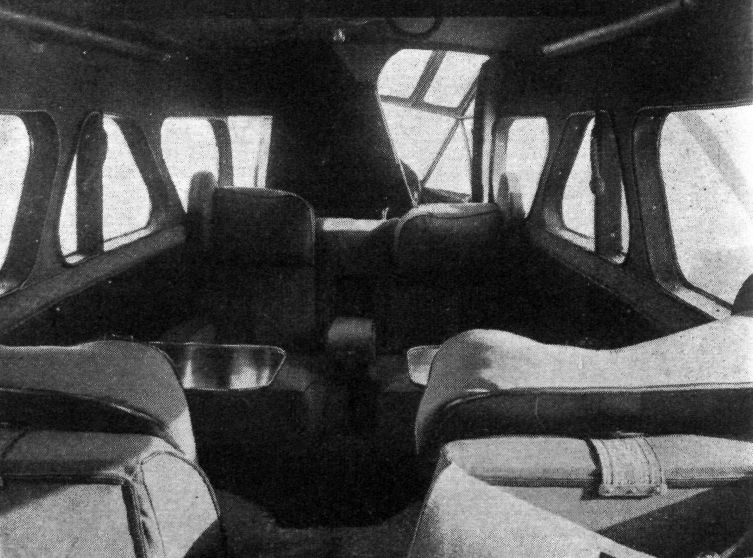 A LUXURY DRAGON: THIS photo show the interior exterior of a "Dragon" recently produced by the de Havilland Aircraft Co., Ltd., as an example of real luxury. 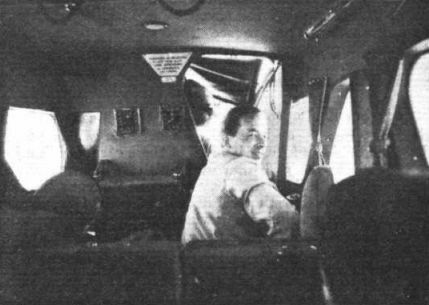 The interior gives extremely comfortable seating for four passengers, and the equipment includes a cocktail bar, and a large lavatory behind the cabin. The door of the latter is in the form of a roller blind. One of the many available furnishing schemes. "Lounge" comfort for the private owner or air-taxi.